Ace designer Manish Malhotra is associated with Mijwan Welfare Society (MWS) since 2010. Kaifi Azmi, the founder of Mijwan works for the empowerment of women living in a small village, encourage rural artisans and bring together the richness of India’s literature and cultural heritage on national stage. Ranbir Kapoor and Deepika Padukone set the Mijwan 2018 stage on fire as showstoppers for Manish Malhotra. Their chemistry together on ramp for Mijwan 2018 was as powerful as they are applauded for their sizzling chemistry in movies ‘Bachna Ae Haseeno’ and ‘Tamasha’. Manish Malhotra presented Luckow origin art chikankari at the ninth edition at Mijwan 2018. Deepika Padukone was absolutely looking like an angel in white lehenga with a plunging neck-line and flared skirt. As Deepika walked the ramp, swarovski and sequins on her lehenga were shining as bright as diamond. The dupatta is gracefully tucked at oneside of her back shoulder, which kept moving as she walked. She finished off her look with a sleek hairstyle and a minimal make-up. Kareena Kapoor Khan & Kartik Aaryan Set The Stage On Fire As Showstoppers For Manish Malhotra! Ranbir Kapoor too was no less, adorably complicating his partner Deepika Padukone. He looked crisp and charming in Lucknowi white kurta and pajama, paired with a black Indo-Western jacket and a contrast white chikankari detailing, which was color coordinating with Deepika Padukone’s white lehenga. 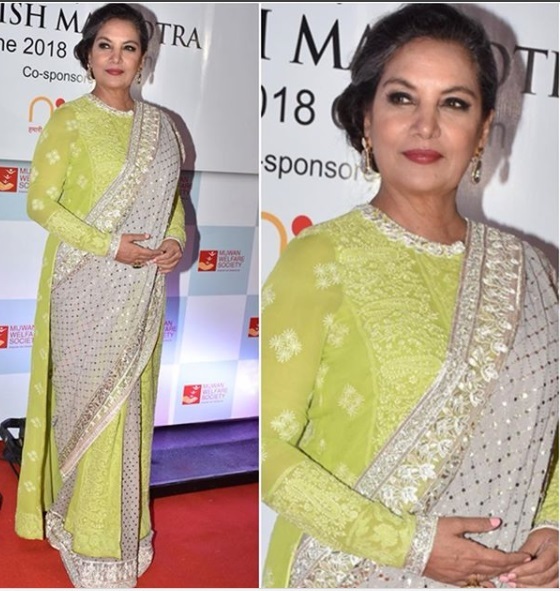 Celebrities Sonakshi Sinha, Shabana Azmi, Yami Gautam, Kriti Kharbanda, Poonam Dhillon, Sonali Bendre, Mouni Roy were among the others who drapped in Manish Malhotra’s ensemble and attended Mijwan 2018 event. Manish Malhotra has once again reignited the fire in an Indian origin artisan and we are nothing but loving the chikankari art more than before. What do you say?